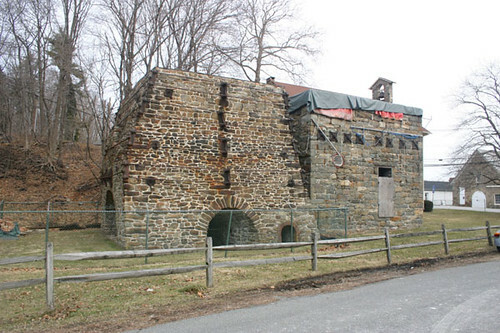 The Oxford Furnace was built in 1741 and was the third such furnace built in NJ, and the first where iron ore was actually mined. It was also the first “hot blast” furnace of its kind. Before that, unheated air was pumped by bellows into the furnace. This furnace used preheated air which was then sent to the furnace and this raised the temperatures even hotter. The air was blown in thru the 3 openings in the sides of the furnace, and molten iron came out thru a 4th hole. The furnace produced railroad car wheels, nails and many other objects, though there’s no evidence it produces cannonballs. Originally 31 feet high, fill has been placed around the base, making it only 22 ft tall. The furnace was converted to use coal as their fuel in the 1800’s & this ensured it’s continued functionality. In 1935 it was donated to the state by it’s owners, the Warren Foundry & pipe Co, and in 1984 it was turned over to Warren County. With a grant of 315,000, the furnace began undergoing restorations in 2001. They are due for completion in spring 2006. The railroads, and their stations, helped transform farmland into bustling New York City suburbs.”The communities that grew are really what grew around the original train stops,” said Kevin Wright, past president of the Bergen County Historical Society. “The population exploded when the railroads went through.”Many of the stations that once served as the entry points to the green pastures of North Jersey are in need of a makeover. get a sense of what the depot looked like in 1872 along with information from the son of the last stationmaster, said Clarke. In the first phase in 2002, a slate roof was installed. A weather vane, finials, cresting and an east dormer were added, said Clarke. Work on a second portion began last year by opening the portico to the station platform, cleaning the stone exterior, upgrading the heating and air-conditioning systems and replacing windows and doors and the cement sidewalk that surrounded the building. Those improvements should be finished soon. The building will then once again house the senior center and serve as a meeting place for groups. Tenafly’s railroad station, along the Northern Railroad, which became part of the Northern Erie line, has been a work in progress over the years, said Kevin Tremble, a member and former chairman of the Historic Preservation Commission. The borough replaced an asphalt roof with slate in 1980. A $269,841 renovation began in 1993 when the roof overhang was restored and roof repaired. The station’s exterior was repainted to match the original colors of the building and air conditioning and attic ventilation added. A $153,000 grant went toward that project. Tenafly, said Tremble. Other towns are also taking steps toward restoring the stations. In Westwood, research is under way to refurbish the 1932 station, which the borough leases from NJ Transit. Upgrades for the bathrooms, the heating system and window replacement are being considered, said Borough Administrator Robert Hoffmann. Using sustainable resources like solar panels and energy efficient insulation are also ideas being floated. other things. And Rutherford’s historic station owned by New Jersey Transit, will undergo a $3.2 million renovation including restoring the brick exterior and fixing the indoor waiting area. Built in 1882, the Pump House served as the pumping station for Richmond’s water supply, as well as an open air public dance hall. This Gothic Revival building is one of the only buildings in the country that served as a public utility and social venue. The Pump House is next to the remains of the first operating canal system in the United States. Closed in 1924, the Pump House was slated for demolition and has remained in city ownership since then. The park is open but the Pump House building is closed to the public, which really is disappointing. The park is extremely pretty and if I had the time I would’ve loved to have explored the rest of the canals, which reportedly stretch over 3 miles. The building itself is quite gothic. The stone work seems to all be in good shape, but it casts a heavy, old feeling, and I imagine this place must be pretty creepy at night. If you’re in the area I certainly recommend stopping by to check this place out. Dingman’s Bridge is a toll bridge across the Delaware River, located not far North of the route 80 crossing. It is the only privately owned toll bridge across the Delaware. That’s right, when you pay your 50c, it goes directly to the owner, no state DOT, no Park Commission, right to the owner. Originally the site of a ferry (run for 100 years), the first bridge was built in 1836, and 11 years later floods washed it away. The ferry was run again until 1850 when a second bridge was built. It lasted 5 years before a windstorm knocked it into the river. The following year, a hastily (and poorly built) bridge was erected and it fell apart due to poor construction. Ferry service would begin again, and continue until 1900 when an iron bridge would be erected. With a history of problems, the current Dingman family is committed to (and probably required by law now) strict maintenance. There has never been a serious accident on the bridge, though there have been some scrapes from careless drivers. Amazingly, the current toll of 50c is not much higher then when the first bridge opened, when the fare was a maximum of 25c for a horse drawn wagon, and 10c for a horse and rider, pedestrians were 2c. It’s actually kind of cool, although driving over a bridge with boards and not pavement can be a tad unnerving.